We’d love your help. 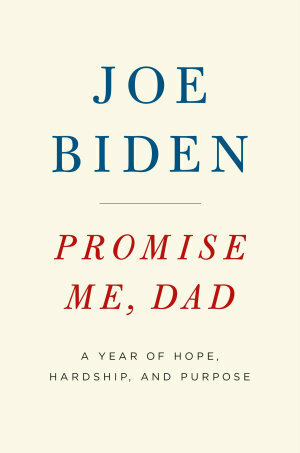 Let us know what’s wrong with this preview of Promise Me, Dad by Joe Biden. A deeply moving memoir about the year that would forever change both a family and a country. In November 2014, thirteen members of the Biden family gathered on Nantucket for Thanksgiving, a tradition they had been celebrating for the past forty years; it was the one constant in what had become a hectic, scrutinized, and overscheduled life. The Thanksgiving holiday was a muc A deeply moving memoir about the year that would forever change both a family and a country. In November 2014, thirteen members of the Biden family gathered on Nantucket for Thanksgiving, a tradition they had been celebrating for the past forty years; it was the one constant in what had become a hectic, scrutinized, and overscheduled life. The Thanksgiving holiday was a much-needed respite, a time to connect, a time to reflect on what the year had brought, and what the future might hold. But this year felt different from all those that had come before. Joe and Jill Biden's eldest son, Beau, had been diagnosed with a malignant brain tumor fifteen months earlier, and his survival was uncertain. "Promise me, Dad," Beau had told his father. "Give me your word that no matter what happens, you're going to be all right." Joe Biden gave him his word. Promise Me, Dad chronicles the year that followed, which would be the most momentous and challenging in Joe Biden's extraordinary life and career. Vice President Biden traveled more than a hundred thousand miles that year, across the world, dealing with crises in Ukraine, Central America, and Iraq. When a call came from New York, or Capitol Hill, or Kyiv, or Baghdad -- Joe, I need your help -- he responded. For twelve months, while Beau fought for and then lost his life, the vice president balanced the twin imperatives of living up to his responsibilities to his country and his responsibilities to his family. And never far away was the insistent and urgent question of whether he should seek the presidency in 2016. The year brought real triumph and accomplishment, and wrenching pain. But even in the worst times, Biden was able to lean on the strength of his long, deep bonds with his family, on his faith, and on his deepening friendship with the man in the Oval Office, Barack Obama. Writing with poignancy and immediacy, Joe Biden allows readers to feel the urgency of each moment, to experience the days when he felt unable to move forward as well as the days when he felt like he could not afford to stop. To ask other readers questions about Promise Me, Dad, please sign up. Just started Carol...like it but of course I like Biden a lot. Do you like it, or have you started it? Carol I also think he is an honest and admirable man. an excellent book. Sorry he did not run. Hi, I am seriously about to close this book and start another. I am only on chapter 3 but am already tired of reading about Biden's political career. Does this book get to the point of the story about his son or will Biden continue drawing out chapters dedicated to his political career? Joe Biden is one of those people who have lived an incredible life. He’s done a lot in his lifetime, but he’s also lost a lot. Yet he still manages to be a fun and lovable guy who doesn’t lose his faith and looks on the bright-side. I’ve always admired and respected Joe Biden. I’ve always connected with him - a good man, a regular Joe if you will, a man who has had his share of sorrow and yet managed to live a life of service as a senator for 36 years and then 8 years as Vice President. I’ve been wanting to read this, but so glad I chose to listen to the audiobook read by him. The love for his family is so beautifully depicted and his grief over losing his son Beau to brain cancer and all of his emotions are conveyed in his voice. I found it so touching to hear him. It’s such a genuine, intimate and moving look at the personal grief and also a telling of some of the things that that he was involved in as Vice President during the time of his son’s illness and after his death. I have to admit that I didn’t enjoy hearing about this side of his life as much as I was in the details of his relationship with his loving family, their times together, especially the annual vacations on “Nanatucket” for Thanksgiving. Having to bury your child is probably the most deeply painful thing that could happen to any parent. Unimaginable to have it happen twice in one’s life as it did to Biden. In some ways, this is a tribute to his son, Beau, who was a good man, a good father, a man of duty and service, actually a lot like his father. I’ve never met Joe Biden, but I feel as though I know him. I respect and admire him even more after listening to this memoir. Brenda - Traveling Sister Terrific review, Angela! Angela M Brenda, thanks so much . but very sad - and searingly honest....I regret not having read it sooner. The most poignant sections of this book for me were the family relationships and the intricacies of Beau’s disease, glioblastoma, ....the most aggressive cancer that begins in the brain. “There was a new crises in Iraq that day, and it needed my attention. Although I knew it was my responsibility, I felt for the first time a sense of resentment that I had to divert focus to anything other than Beau, even for just half an hour. My son was in one room in extremis and I was sitting in another, forced to deal with a problem sixty-two miles away”. There is no question of how much Joe Biden loves his country and family. He takes both jobs seriously. His children - wife - extended family - are all cut from the same thread. GOOD PEOPLE! Getting to know Beau and his brother Hunter was especially moving to me. Their birthdays were only a day apart.....and the brotherly bond between them was inspiring. *Beau* was a remarkable guy. It’s inconceivable what he went through. He met his cancer treatments head on - never resisting the most uncomfortable aggressive cancer treatments to fight the most aggressive type of cancer that he had. He ‘was’ not giving up. He was concerned for his wife, children, brother, sister, mom, and ‘pop’....( Joe). At one point Beau was ‘running’ again. I was soooo happy for his entire family. God...if I WANTED HIS RECOVERY ( so bad) and I KNEW this outcome .....I can’t imagine the roller coaster emotions of that last year. I totally respect Joe Biden, though, love this man. I am so sorry for his loss. For his entire family’s loss. Taking time for oneself to grieve- is responsible. And that, an easy, steady, calm rhythm, is the overall feeling of this book. This is, in part, a journey alongside him through political events that he was involved with during that year, overseeing much of the international issues in the Ukraine and Iraq, plus the “Northern Triangle” of Central America. Another aspect of this is his internal struggle with the idea of potentially running for president. And then there’s Beau, his son, whose health is questionable at first, and deteriorates as his treatments for glioblastoma, go on. It saps the strength out of you to read this, every parent’s worst nightmare to watch their child, no matter their child’s age. There are also numerous heartwarming family moments, and I could feel the importance of family, his faith, and even his belief in this political system that we have was strongly felt. This was heartbreaking to read at times, but I also loved how committed this man was and is to doing the right thing, not only for himself and his family, but for the country, and for the world. And then yesterday, when I sat down, taking a momentary break from reading to check the television, I saw the unfolding news on the shooting at the high school in Parkland, Florida. And today, when I sat down to do the same, it was the current President speaking on the shooting, and I have to wonder at the way things are today. There is so much love in this family, in this book. This is such an incredibly poignant read. Not only because of his losses, but also because of the kindness and solace he offers to others. I really loved this, I loved how devoted he is to his family, to the country, and to finding resolutions to world problems. I loved the relationship he had and has with the Obamas, who consider themselves part of the Biden clan. I loved how he never really seemed to lose sight of the growth he gained because of his past tragedies, and that he was able to see those blessings that came out of those events. Politically, this is worth reading, although it is not particularly heavy on the politics. At its heart, this is really a memoir of a parent who has lost a child, and the wisdom he has gained through his life that helped him deal with this crushing episode. I would hope that this would be somewhat healing for him to write, and comforting for others to read, knowing that someone else has survived this awful fate. Many thanks, once again, to the Public Library system, and the many Librarians that manage, organize and keep it running, for the loan of this book! How do I convince Joe Biden to write an entire book about his friendship with Obama? At a time when many politicians climb onto soap boxes and publish pieces to extol their own greatness, former Vice-President Joe Biden released this short book that seeks to rise above the fray and offer a story of hope, despair, and personal reflection. It is perhaps the first book I have read where a politician talks of their choice to turn away from high office, but it is much more than that, as the attentive and dedicated reader will discover. At the heart of the story is the struggle Biden At a time when many politicians climb onto soap boxes and publish pieces to extol their own greatness, former Vice-President Joe Biden released this short book that seeks to rise above the fray and offer a story of hope, despair, and personal reflection. It is perhaps the first book I have read where a politician talks of their choice to turn away from high office, but it is much more than that, as the attentive and dedicated reader will discover. At the heart of the story is the struggle Biden had with his eldest son’s brain cancer diagnosis. This realisation puts everything into perspective for the vice-president, as well as the entire Biden family. Wanting to keep things private, no one would share the news publicly and Biden was still trying to serve the Obama Administration as effectively as possible. Woven into the story are countless international crises that Biden was required to handle, sometimes an eager distraction while at other times an anchor that kept him from the focus on family and loved ones. Added to that, there was the 2016 presidential election to consider. Would Biden, a capable long-term politician and hands-on member of the Executive Branch, toss his hat into the ring? Those in Democrat circles watched and waited, the country soundlessly tapped their collective foot, still unaware of the chaos that brewed for the Biden family below the surface. When Beau Biden did pass, it was both a relief and a blow to the entire Biden family, as the glue that held them all together was lost. The elder Biden tried to remember all the promises he made to his son, some in passing and a few heart-felt pleas to carry the torch. The most important of these was the promise not to let 2016 pass without a Biden running for president. The latter portion of the book, with Beau gone and Joe trying to wrap his head around it all, turns to the 2016 race. Would he run? Should he run? Could he run and make a difference? It would seem that while Biden pondered his options, the country had already placed him as a front-runner. As Biden confides, it was his decision and his alone. GOP members and the media would only offer kid gloves for so long, as well as the Clinton camp that began cursing another heavyweight to neutralise. In the end, Biden chose what he felt was best, a promise to Beau that he would do his best to be the man everyone knew. The Joe Biden who used compassion over a club, integrity over vicious words, and intelligence over knee-jerk reactions. This is a wonderful piece, suited for all readers who like the more human side of politicians, though can understand the rhetoric that goes along with having a role in the machine. Touching at times, Biden pulls out all the stops and tells a story that will not soon be forgotten. When I picked up this book, I had just finished a thorough examination of the 2016 presidential election, one in which I was left gagging at the atrocious actions of people vying to represent the entire American population. However, I wanted to see more about the narrative from the Biden perspective, the man who chose not to put his hat in the ring. While I expected a strong political discussion throughout, I was happy to find something more complex. Within these pages rests a narrative that wove together the power of American politics, international clashes, family interactions, and a man’s struggle to come to terms with his son’s eventual illness. The reader is in for a strong piece here, forced to handle emotions and see how world events shaped the man who sought to keep it all together and away from the public eye. Biden does not pull punches in this piece, but does not make excuses either. He tells of world events (ISIS, ISIL, Ukraine, Russia), as well as domestic policies in the Obama Administration, but he also injects strong ties to family and the love they bring him. This is a piece that helps shape a man and his love for country, family, and self. It is impossible to divorce any of it effectively. A few things that I took away from this book include the knowledge that life does not stop when tragedy knocks, promises to those who are going before us mean more than a simple nod of the head, and there is more to life than tossing mud in the eyes of one’s opponents. Anyone who has been through a personal tragedy will know that while they are numb, a simple look out the window will show that life is not prepared to stop for grieving, it moves along. Such is one of the key sentiments that Biden shares with the reader. Terror still occurs, state sovereignty is not respected, domestic issues do not solve themselves. Biden was forced to juggle all of it in order to mix his public and personal lives. It is obvious (but nice to hear) that others struggle with this as well. The list of promises made to the dying can be heart-wrenching, as the reader may know. One always promises to do this and that, if only to bring a sense of ease to the one who will soon be gone. However, Biden did not take his promises to Beau as simple window dressing, those “yah, umm, sure...” moments. He felt that he owed it to the son who always supported him and whose political light shone just as powerfully. Biden shows that he is a different sort of man, looking to others rather than his own greatness, to shape the future of his own legacy. Finally, one cannot deny that 2016 was one of the most divisive presidential election campaigns in recent history. That Biden sought to enter the race is commendable, especially looking at those with whom he would cross paths. The decision not to run, where he would be forced to face Clinton, Sanders, and Trump (and countless others), may have been determining factors. But, Biden seems less interested in gouging out the eyes of others and more about trying to build the country up. Few readers would deny that 2016 was less about policy and more about how to denigrate others in the hopes of tearing them down. Did a newly-wounded Biden really need that in his life? It is the ultimate sacrifice to bear one’s self to the electorate, especially in these days when no one holds back with their mud slinging. While there will be some readers who want dirt-only with their political stories, I would recommend this piece to anyone with a heart or who has been touched with the loss of a loved one. It seeks to unite, as much as politics usually divides, and tells of the powerlessness one can feel at the hands of cancer, but offers the strength to persevere. Kudos, Mr. Vice-President, for such a wonderful piece. After reading this, I would strongly like to read a thorough version of your memoirs, should you choose to pen them. This is a book I really liked and it moved me emotionally. I have to admit, I have always liked Joe Biden. He says what he thinks and to hell with it. He has a good moral background. America, family, and common sense are the key phrases I think of when I think of Joe. You may disagree but that's ok, read the book and write your own review. This is mine. He is compassionate about a lot of things and none of them are hate, war, or bringing anyone else down. His love for his family and America are obvious in his past and present. He has a good disposition in general, and in how he handles situations, even things so horrific as the death of his son. He didn't get bitter, or lash out, or become a terrible person...he remained...Joe. This was very difficult to listen to in parts..I choked up and cried, I am a mom and to lose a son would be so crippling, so devastating..I don't know what kind of person I would become, how I would cope. Joe has strength and courage. It's not like he had a small job he could go take a few weeks off and mourn. I absolutely love Joe Biden. In 2015 I donated money to a SuperPac that was trying to convince Joe to run for President. I truly believe that had he run he would have beat both Hillary and 45. Just think about how different our country would be right now. No Congressional investigations, no special prosecutor, and no indictments. Our country would still be respected among our allies. I was deeply disappointed when Joe decided not to run but I completely understood why. He had just lost his oldest I absolutely love Joe Biden. He had just lost his oldest son Beau Biden to brain cancer, the same brain cancer that Senator John McCain is now battling( If you haven't already seen it you should go look at the video of Joe & Megan McCain on The View). Joe Biden has experienced more pain and loss than anyone should have to bare. While not yet 30 years old Joe lost his first wife and infant daughter in a car accident that left his 2 sons Beau and Hunter badly injured. I don't have children but I can only imagine how horrible it must be to lose one child but Joe has lost 2. With so much heartbreak Joe still carries within him a bright light and a warmness radiates from him. Promise Me, Dad is part political memoir but mostly its a memoir of a fathers grief. Joe Biden is a man of great heart, humility, integrity, and decency. Joe Biden is a man who is grounded and relatable. This country is a better place because of his service. Disappointing. I hesitated to give this a 3 star rating, feeling it's more 2 - 2.5. Let me preface my review by saying in no way does my opinion on this book reflect my political leanings. I happen to like Joe Biden. I thought he was a great VP. I have the utmost respect for him, for his longstanding career, and my heart goes out to him and his family over the loss of Beau, and previously, his first wife and daughter. I hesitate to criticize a book being plugged as a book about the last year of Disappointing. I hesitated to give this a 3 star rating, feeling it's more 2 - 2.5. I hesitate to criticize a book being plugged as a book about the last year of Beau Biden's life. Mixed feelings about doing so, I do not intend any disrespect or diminish the loss, but an honest review is always required regardless of the subject. This book feels much more "look at all the great things I did that year" with a little bit of looking at that last year of Beau's life thrown in. I thought this would be more about the family that year. It wasn't. While reading about Joe's part in the Ukraine-Russia crisis, Iraq and the Northern Triangle was interesting, I didn't pick this book up to read about all the amazing and miraculous things Joe was achieving by his stellar diplomacy. It felt very, very much like he was laying out his case as to why he would be worthy President come 2020. He talked quite a bit about his potential 2016 run, naming numerous people - celebrity to political to steel worker, who would back him in the run, how everyone was convinced he'd win. Wow. Totally disagree on that one. He had run previously, didn't work out. People now hated the Dem's even more, no way would they tag the VP as the next Pres. they wanted change. He did not reflect change. The writings about Beau's fight and the family as a whole were well written. They are clearly a tight knit, loving, supportive family. You would want to know them, be in their inner circle. I was troubled with how little he wrote about Beau's wife Hallie. When Beau was going through various testing, chemo, radiation and so on, Joe would go on & on about how Hunter, his second son, was always by Beau's side. Where was Hallie? He mentioned her being there once or twice but the overall it was intimated she wasn't in the picture. I find it hard to believe she wasn't there at he husband's side. That she wasn't included in the decision making, to hear Joe tell it it was Beau and Hunter, no one else. That felt unfair to her. Who knows? Maybe she didn't have as integral a role in being there as a spouse normally would, but that would be surprising. At times he wasn't as glowing about President Obama as I would have expected. It felt as though he harbors resentment that Obama was pushing him to not run for office, that Obama was leaning towards Hillary almost from the get go. During their weekly lunches Obama would often inquire if Joe had made a decision on entering the race. Joe was taking so long to make a decision, while understanding to a degree, it had to have been irritating to those needing an answer on whether they should move forward in building a campaign. I think one person should have said to Joe "If it's taking you this long to decide, that's your decision. The time isn't right". This is the inspiring story of how Joe Biden channels the grief over losing his son, Beau, into a successful campaign for the 2016 Democratic nomination. Propelled by a promise he made to his late son to continue his path of public service, and boosted by his extraordinary accomplishments as vice-president, Biden outmaneuvered the massive political machine backing a well-financed Hillary Clinton to win the nomination and take on Donald Trump. Except that's not what happened. But if you were an al This is the inspiring story of how Joe Biden channels the grief over losing his son, Beau, into a successful campaign for the 2016 Democratic nomination. Propelled by a promise he made to his late son to continue his path of public service, and boosted by his extraordinary accomplishments as vice-president, Biden outmaneuvered the massive political machine backing a well-financed Hillary Clinton to win the nomination and take on Donald Trump. Except that's not what happened. But if you were an alien who floated down to earth to read this book with no prior knowledge of 2016, that's exactly what you'd think happened until virtually the last page. Heck, I was starting to buy into the idea that's what happened, and I remember 2016 all too well. I grew up close to Wilmington, DE. Everyone knows the Bidens. I had friends who attended Tatnall with his children. He's my third Senator (that's right, Delaware, we use you for your tax free shopping and steal your Senators). I've always has a fondness for good ole' Uncle Joe, but I have to admit this book confused me a bit. I felt like I was reading a commercial for Biden 2016 2020, not a tribute to Beau, a good man who died way too young. Beau is really in the background of this book. Most of what Biden wants to tell readers seems to be about his experiences working with the unstable democracies in the Ukraine, central America, and Iraq. That not to say I wasn't moved by Beau's story, or that I didn't cry. I'm not a robot. And there were parts of this book I did enjoy and find value in. But when I look at it logically: 250 pages long with large-ish font, a back and forth timeline that can be confusing in places, an author who writes about himself as if he's his own hero... I can't get above 3 stars with this one. 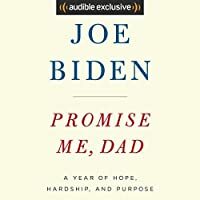 Reading Joe Biden’s Promise Me, Dad: A Year of Hope, Hardship, and Purpose I was reminded again how great it was to have Biden-as thoughtful, compassionate, and smart as anyone you are likely to meet --as our 45th President. I mean, wow, we really dodged a bullet there. Just think; the current President of the United States of America could be an outdated, narcissistic jackass who is more concerned with his social media accounts, lying about his weight, and the imminent threat of sharks than gov Reading Joe Biden’s Promise Me, Dad: A Year of Hope, Hardship, and Purpose I was reminded again how great it was to have Biden-as thoughtful, compassionate, and smart as anyone you are likely to meet --as our 45th President. I mean, wow, we really dodged a bullet there. Just think; the current President of the United States of America could be an outdated, narcissistic jackass who is more concerned with his social media accounts, lying about his weight, and the imminent threat of sharks than governing our country. This is a tale of profound family love between fathers and his sons, and between siblings. Despite Beau being in his 40’s, Joe sees him always as an 8-year-old boy. He will always be his little boy and watching him battle glioblastoma is crushing. It is apparent that Biden is blessed with the support and love of his family and friends something he will need, as Beau gets sicker and sicker. Reading Promise Me, Dad, I have learned that 1.) there are moments of true grace and compassion in this harsh world we live in, and 2.) I apparently am not above weeping uncontrollably in my car at my son’s elementary school pick up line. Think of the ugliest crier you know and then immerse them in mucus and you will have me yesterday afternoon. The ball of scrunched up Kleenex tissues was the size of a Sumo wrestler’s head and stout enough to set off the passenger seat air-bag warning sensor. The school’s principal even came out to see if I needed medical attention. Joe Biden comes off as a truly good guy who cares about folks and making our country and our world better. This book is full of instances where his focus transitions from his own suffering to making other people feel better. There is a moment where Barrack Obama gets visibly upset hearing about Beau’s health decline and Joe works to comfort and console him. There is another instance with the father of a murdered New York policeman, Wei Tang Liu, showing up to provide solace to Joe that would melt even the most frozen heart in America (which is, of course, the heart of actress Betty White). In fact if you do not have tears running down your burning cheeks at the end of this well-written book I can only hazard to guess that you must in fact be an evil alien robot Cylon and Dr. Who will need to beam in and perform a petrificus totalus spell on you to take you back to the forest moon of Endor. This is wonderful book, and while sad it demonstrates the resiliency of people to overcome great sadness as well as the humanity shown when giving comfort to our families, friends, and neighbors in pain (often from unexpected places). Joe Biden was into his second term as vice-president of the United States when his son Beau was diagnosed with a brain tumor. As the Biden family was gathering together in Nantucket for Thanksgiving, it was to be their last with Beau but they did not know this yet. Amid national and international crises vice-president Biden was preoccupied and as the health of his son grew more uncertain, even more so. There was also the question as to wether he was going to run for president in 2016. Vice-presi Joe Biden was into his second term as vice-president of the United States when his son Beau was diagnosed with a brain tumor. As the Biden family was gathering together in Nantucket for Thanksgiving, it was to be their last with Beau but they did not know this yet. Amid national and international crises vice-president Biden was preoccupied and as the health of his son grew more uncertain, even more so. There was also the question as to wether he was going to run for president in 2016. Vice-president Biden had a lot on his plate and this is his journey. This work is by and about Joe Biden, the vice-president to Barack Obama. Just yesterday I was having a conversation with my mom about how there are certain people that you can not help but deeply dislike without knowing them personally. Conversely, there are also people that are easy to love and respect without knowing them personally and (for me, at least) Joe Biden falls into the latter category. And that was before I read this memoir. Part political and family-oriented, this is the story of a man that had to juggle multiple problems and that was before Beau's diagnosis. As far as the politica aspect, it was not too heavy and simple enough to convey a general picture. Biden oversaw crises in Iraq, Ukraine and the "Northern Triangle" of Central America (Honduras, El Salvador, and Guatemala). At the home front, he dealt with senseless shootings and the economy (among other issues). Travelling often and speaking with different world representatives, Biden dealt firsthand with the international community. His bond with the president was also highlighted as their friendship and partnership continued to grow. It makes me believe that all those Obama-Biden memes that got so much attention after the last election are very much real interactions. The memoir by Joe Biden covers his last year as vice president and the tragedy of his son’s death His son, Beau, was the Attorney General of Delaware and was planning on running for governor of Delaware when he was diagnosed with brain cancer. This is not Joe Biden’s first family tragedy. When Joe was first elected Senator from Delaware, his wife and daughter were killed in a car accident. His two sons, Beau age three and Hunter age two, were in the back seat. They were injured but survived the The memoir by Joe Biden covers his last year as vice president and the tragedy of his son’s death His son, Beau, was the Attorney General of Delaware and was planning on running for governor of Delaware when he was diagnosed with brain cancer. This is not Joe Biden’s first family tragedy. When Joe was first elected Senator from Delaware, his wife and daughter were killed in a car accident. His two sons, Beau age three and Hunter age two, were in the back seat. They were injured but survived the crash. Biden provided a good overview of the ongoing research of glioblastoma brain cancer. The book is well written, but I found it to be an emotional book to read. I wished there had been more about Beau’s family particularly his wife, Hallie. Biden spoke of his grandchild but little was mentioned about Hallie. But I understand how difficult it must have been for Biden to write. Biden provided an overview of his last year as vice president along with some insights about people he worked with. I read this as an audiobook downloaded from Audible. The book is almost eight hours long. Joe Biden narrated the book. To me, this book was an explanation. Perhaps an apology, but mainly an explanation about why he chose not to run. And, I don't have much to say about this book. It's incredibly well-written and insanely moving. Between bouncing about domestic and foreign problems that came up during this period (2014-2016), it also covers his son's, Beau, battle with cancer that he eventually lost. And, yes, I did cry. A few times. And teared up about every s This review and others can be found on BW Book Reviews. And, yes, I did cry. A few times. And teared up about every single chapter. So, don't read it in public. Unless you like crying in public, then go for it and don't let me dictate your life. What I really loved was how Biden quietly showed just how much he had going on in his life, without it feeling as if he was hammering it into me that it was too much stress and too many hardships that were pressed upon him. He showed exactly why. He weaved in the never-ending Ukraine/Russia problems. The issues with ISIL and trying to get people from the area to work together. The domestic shootings, from the two police officers murdered in their patrol car to the Charleston shooting. And then he covered Beau's cancer and the progression of that. He explained the difficult things, using them quietly to make the point for exactly why he chose not to run. An intense, moving memoir by a thoughtful, inspiring man. At times this book was hard to read, given all that the Biden family went through during Beau’s illness. Joe Biden’s devotion to his family is truly remarkable, as is his devotion to his job and country. His l An intense, moving memoir by a thoughtful, inspiring man. At times this book was hard to read, given all that the Biden family went through during Beau’s illness. Joe Biden’s devotion to his family is truly remarkable, as is his devotion to his job and country. His love of family as well as his love of country is all encompassing. We sorely missed out when he decided not to run for President in 2016, but his reasons were understandable. If I have any quibble with this book, it’s that the sections on Iraq, the Ukraine, and Central America are a bit too heavy on policy minutiae that we really didn’t need to know. That kind of stuff may have gotten Joe through the worst times of his life, but it doesn’t add so much to this book. The book is best when it concentrates on the personal, as does Joe. I love this guy! He is all heart. PLEASE RUN FOR PRESIDENT IN 2020!!!!!!! FYI for those not in the know. The widow of Joe Biden’s late son Beau Biden has started a romantic relationship with Beau’s brother Hunter Biden, the f PLEASE RUN FOR PRESIDENT IN 2020!!!!!!! The widow of Joe Biden’s late son Beau Biden has started a romantic relationship with Beau’s brother Hunter Biden, the former vice president’s younger son. Hallie was devastated when her husband, Beau, died after suffering from brain cancer in May 2015. But she has since struck up a romance with Beau’s brother Hunter, 47, who has separated from his wife, Kathleen. We’re told Hallie and Hunter are now officially a couple. The astonishing family drama caps a difficult period for the Bidens following the death of Beau at age 46. The former vice president cited the death of his elder son as one of the reasons he decided in October 2015 against running for president. Former Vice President Biden confirmed the relationship to Page Six and said that he and his wife, Dr. Jill Biden, have given their blessing to the couple. Beau, the former attorney general of Delaware, and Hallie have two children, named Natalie and, confusingly, Hunter. A source told us that the elder Hunter and Kathleen Biden separated in October 2015, five months after Beau’s death and around the time that Joe Biden decided not to make a presidential run. It is not clear if the estranged couple has yet filed for divorce. I can relate to this book, as my sister passed away from the same glio cancer that Beau had. I can definitely relate to Joe Biden's description of the feelings when they heard the dreaded glio diagnosis to some of the struggles that he went through watching this happen. One thing that struck me was that my sister died 10 years before, and yet, while there are new treatments available, the outcome is still the same and the prognosis is poor. While I do not pretend to be able to understand the pres I can relate to this book, as my sister passed away from the same glio cancer that Beau had. I can definitely relate to Joe Biden's description of the feelings when they heard the dreaded glio diagnosis to some of the struggles that he went through watching this happen. One thing that struck me was that my sister died 10 years before, and yet, while there are new treatments available, the outcome is still the same and the prognosis is poor. While I do not pretend to be able to understand the pressures Mr. Biden faced dealing with the demands of the Vice Presidency, I do understand what its like to have to deal with life demands when watching a loved one die. He dealt with the conflict of work pressures and public life with wanting to be with his son; my conflict was on a lesser scale, but is was very real nevertheless. I was in the process of studying for the bar exam when they stopped treatments on my sister. I was going to forego the bar that time around and take it later so I could spend time with her, but she told me that if I did that, she would kill me. So, I did take it and I was happy that she knew that I did that. While Beau's illness and the Biden family were the focal points of this book, there were also glimpses into the life of a Vice President. I found his insights into his relationship with Mr. Obama to be particularly interesting; I knew they were close and had respect for one another publicly, and I was glad to see that they had the same relationship privately. I am not putting this down because it’s not a good book. I was and am interested in it. But I think I need to try later. My uncle passed away from the same type of cancer as Joe’s son. Around the same time too. It’s just a little much right now. This was an emotional read. A personal look at love, family, loss and grief. I’ve always respected Joe Biden and his core beliefs. Losing a child, I don’t know of anything worse. Really was curious about this book. It was so heartfelt and genuine. I definitely recommend! I enjoyed reading this book. Although the focus is on the Biden family and how it reacted to the illness and death of Beau Biden, Vice President Biden tells the story in context of his public life as Vice President. The Biden family's committment to excellence, the bedrock of faith they draw from, and their deeply committed love for each other is an inspirational read. Biden talks about his accomplishments as Vice President, the relationship forged with President Obama, and his experience in inte I enjoyed reading this book. Although the focus is on the Biden family and how it reacted to the illness and death of Beau Biden, Vice President Biden tells the story in context of his public life as Vice President. Biden talks about his accomplishments as Vice President, the relationship forged with President Obama, and his experience in international politics. Biden also covers the behind the scenes story of his consideration regarding running for office in 2016. One could see the book as preparing the way for a future campaign. Beau Biden's loss was devestating for his family. And many believe his loss is also a nation's loss, that Beau was destined to be president. OK, I give props to Biden for honesty with regards to his family. Writing is mostly alright. Nothing special but adequate. I don't follow politics closely. Based on the title, I was expecting more personal stories rather than a recount of Biden's time in office. I also thought that he would address his son Hunter's relationship with Beau's widow. Overall, it was boring and self indulgent. However, the reflection of Beau's death was very poignant. I love this book it really help me understand Joe Biden better than I had before. The timeline of events and the way the book was written flowed very well. The book did not wander or meander and stayed very personal. Full of heartbreak and full of hope, the former Vice President's book on his son's last year is incredible. You'll probably cry, but you'll also be inspired. This book was excellent and absolutely gut wrenching even though I knew what was going to happen. I definitely cried while reading this. I especially found the parts about Beau’s brother, Hunter to be so extremely sad. I liked this listen in to Joe Biden and his experience of being Vice President and dealing with the illness and death of his beloved son. I really love being inspired by people with strong values, and living out those values and deep love of family. So while not being from the USA I still found this a very valuable read. Joe Biden represented Delaware for 36 years in the U.S. Senate before serving as 47th Vice President of the United States from 2009 to 2017. As the Vice President, Joe Biden addressed important issues facing the nation and represented America abroad, traveling over 1.2 million miles to more than 50 countries. He convened sessions of the President’s Cabinet, led interagency efforts, and worked with Joe Biden represented Delaware for 36 years in the U.S. Senate before serving as 47th Vice President of the United States from 2009 to 2017. As the Vice President, Joe Biden addressed important issues facing the nation and represented America abroad, traveling over 1.2 million miles to more than 50 countries. He convened sessions of the President’s Cabinet, led interagency efforts, and worked with Congress in his fight to raise the living standards of middle class Americans, reduce gun violence, address violence against women, and end cancer as we know it.